But most work best with a specific story, situation, or character set — we don't see, for example, The Little Mermaid's Ursula up against Jiminy Cricket, or Shere Khan, from The Jungle Book (or even the version from TaleSpin) having it out with Dumbo. In fact, only one Disney villain has the vitality and the versatility to switch easily from hero to hero, over a period of many decades, and that's the one variously known as Black Pete, Big Bad Pete, Sneaky Pete, or just plain Pete. 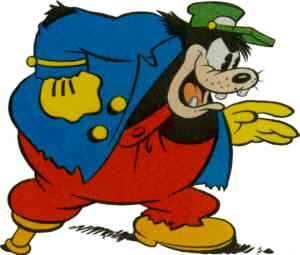 It isn't absolutely certain, because not all of Disney's works from this period survive, but Pete's first appearance is believed to have been in Alice Solves the Puzzle, one of a series in which Alice, a live-action little girl, had adventures in Cartoonland with a funny animal named Julius the Cat (who, not surprisingly, resembled Felix). There, Pete's full name was Bootleg Pete, and his villainous act was to attempt to augment his crossword puzzle collection by stealing the one Alice was working on. This cartoon was released Feb. 15, 1925. Julius, by the way, was Disney's first ongoing cartoon character. Pete was second. Pete continued to antagonize Alice and Julius, not in every cartoon but in enough to make his peg leg, his cigar, and his big, burly, menacing figure a familiar sight to audiences.. After the Alice series ran its course, Pete took on Disney's next big star, Oswald the Lucky Rabbit, a couple of times. Another name he used during this period was Putrid Pete. And when Oswald was legally hijacked from Disney, eventually to wind up with Walter Lantz, Pete continued to antagonize Oswald. In fact, Lantz's studio kept on using him that way until 1933, by which time it was no longer possible to ignore the fact that two studios were using two different versions of the same character. It wasn't until he'd become Mickey's recurring foe that Pete's species was decided. At first, he could have been anything from a grizzly bear to, as at least one critic has suggested, a tailless rat. (And in fact, in the Lantz cartoons, he was more-or-less a bear.) But Mickey Mouse's bad guy just naturally had to be a cat. Once settled, he remained a cat whether played against Donald Duck or Fresh-Up Freddie. When Mickey became a comics star, Pete became his most frequently recurring villain. (The diminutive hero, coupled with a physically overbearing foe, was strongly reminiscent, as some comics historians have noted, of the relationship between Wash Tubbs and his bad guy, Bull Dawson.) From there, Pete got into comic books, where to this day, he often turns up in a menacing role — tho the level of menace he represents, in comics as well as in animation, can range from gun-toting desperado to a mere unreasonable boss. He could play any role from an intolerable customer to a sheriff trying to serve an eviction notice — but always, he was a crass, rude bully, giving an impression he was no more than one tiny provocation away from physical violence. Even after settling on a species, Pete continued to evolve in appearance. Sometimes his peg would switch from one leg to the other, as animators occasionally had trouble remembering which it was supposed to be. Sometimes it was left off entirely, either for that reason or (as was frequently the case) because Disney felt the exaggeration of his handicap to have bordered on cruelty. Eventually it was dropped altogether, a fact that was noted at least once in the comic strip, in 1941, when Mickey remarked on Pete having switched to a more natural-looking prosthetic. It was then that he became primarily known as Black Pete, a name he kept until the word came to be regarded as having invidious racial overtones. After that, he was Sneaky Pete, Big Bad Pete, or something similar. Nowadays, he's simply known as Pete. During the early years of the sound era, Pete's deep, gruff voice was usually done by Billy Bletcher, whose other roles include Disney's Big Bad Wolf, Warner Bros.' Paw Bear, and The Captain in MGM's version of The Captain & the Kids. In more recent animation, he's been voiced by Jim Cummings, who has also done Bonkers Bobcat, Winnie the Pooh and Savage Dragon. It was Cummings who voiced Pete in a relatively recent major role, Goofy's regular irritant in Goof Troop (1992). There, Pete's menace level is relatively low — he's merely Peter "Pete" Pete, an unpleasant neighbor. But wherever he goes and whatever he does, he remains the same nasty, unscrupulous Pete who used to threaten Alice, Julius, Oswald and Mickey, and whom generations have loved to hate. Text ©2004-09 Donald D. Markstein. Art © Walt Disney Co.